This node allows you to use IES profiles to light a scene. Note: this node is intended for use in a Light material, using it for mesh lights (with an Object material) will not work correctly. 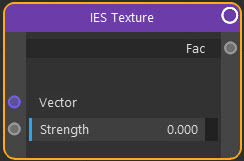 To use it, link the IES Texture node to the 'Strength' port of an Emission shader. Only available in the Node Settings tab of the node in the Attributes pane of the node editor. This is the IES profile file to use. You can then alter the settings in the Mapping node to control light position, etc. The strength of the IES light. The output from the node which should be connected to the 'Strength' input port of an Emission shader.